The Control Panel is the narrow display to the side of the playing table (landscape mode) or above the table (portrait mode). This is the tab you will probably use the most, once you are used to BriJ. It contains an array of buttons for the functions you'll most commonly need, plus access to all the more advanced custom settings and dealing methods. Load Board offers a list of deals to start from. (1) You can save any random deal for replaying at a later date. Use this menu to reload the deal. (2) You can download hands from your club's BridgeWebs site. BriJ retrieves all hands from the session (with dealer details, makeable contracts and pairs results, if available). You can then work through the boards to see where you went wrong! This illustration is for the play phase, but it also works for bidding. North Play. The first part suggests a card to play and why this choice might be suitable. This is followed by a large play link. Touch this to accept BriJ's recommendation. Below that there is a reminder of the bidding. In this case W est was dealer, West and North passed ( - - ) and East opened with 1♦ . Bidding finished at 2NT. Unseen cards lists the cards which have not yet been played and are not visible in dummy. BriJ uses all this information to help decide on the card to play. Inferences from bidding and play keeps track of what can be deduced about other players hands, both from the bidding and the play so far. rho is your right hand opponent. lho is your left hand opponent. Depending on circumstances, inferences may also be shown for Declarer and your partner. This gives a basic introduction to the main features of BriJ. "Touch here for more information" takes you to a page with links to the BriJ Convention Card and to the various pages in this website. It's best to follow this link for the most up-to-date information about BriJ, particularly to see if there have been any recent updates. As in some of the other tabs, scroll the window by dragging it upwards. This tab shows information about the numbers of tricks you might be able to make in various contracts. You can use this to check whether your bidding reached a suitable target, perhaps as a sacrifice contract (one that scores better than allowing the opponents to make their contract). At first the panel shows as in the left hand illustration. BriJ targets has been touched to get BriJ's idea of how many tricks might be made in each suit (or NT) for all possible positions of Declarer. Load board gives you another way of loading a previously played or downloaded hand. The top section shows the pbn filename and board number, followed by a makeable tricks analysis from your website, if supplied by your club's card dealing system. Then comes individual results by the pair numbers who played the hand. 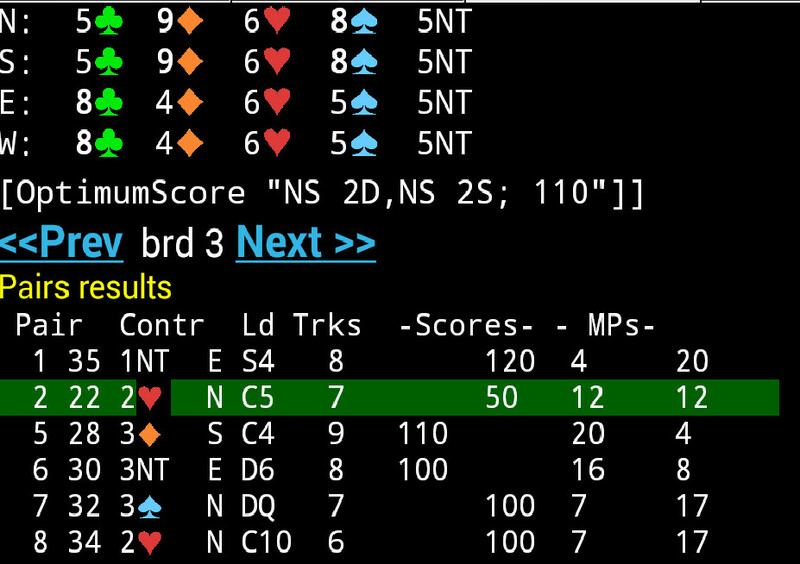 Finally BriJ targets shows BriJ's auto-bid- and-play prediction of a possible result.